Editing a hosting package may not edit the sites that are already on the package. To get your sites on the newly edited package you need to upgrade them to the same package name. After doing so the new stats will show. 1. What is a Package in WHM and How can i Create it? Please login to WHM, and in the left menu, go to the “DNS Functions” section and click on the “Edit Zone Templates” link. Here you will see three templates. The standardvirtualftp template is used for every new account. Please choose and edit this template with your custom settings. What is a WHM and What is my WHM URL? WHM also know as Web Hosting Management is noting but a graphical tool which helps you manage your hosting account if you are a Reseller or have a VPS or Dedicated server running Linux. WHM makes it very easy to perform server / account related tasks just by clicking a few buttons. If you a Reseller or have a VPS / Dedicated server your login would be example.com/whm , where example.com will be replaced with your own domain name. What is a Package in WHM and How can i Create it? A package is collection of predefined specifications which define what a user or domain may have access to. An example would be our shared web hosting plans (Starter, Basic, Silver). You would need at least 1 package to be created in order to create a new account from your WHM. You may have multiple sites installed on one package as well. 1. Disk Quota (MB) – Disk space in megabytes available for the cPanel account. 2. Bandwidth (MB) – Data transfer in megabytes available for the cPanel account. As a reseller, it is a good idea to create multiple packages of different sizes. This strategy gives potential customers more options to choose from when they sign up with you. Also, with several packages, your existing customers will have options for upgrading as their hosting needs increase. 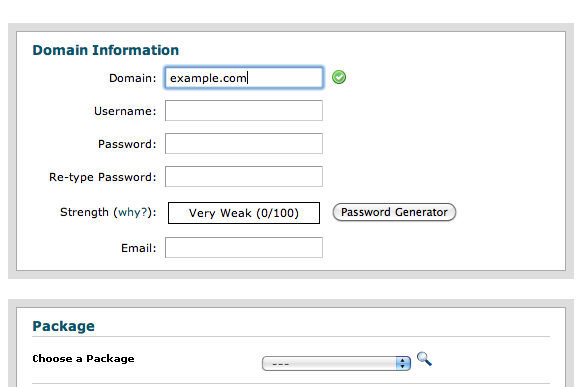 Packages also allow you to limit options available inside of the cPanel using Feature Lists. Creating a feature list is easy, in WHM, click on the “Feature Manager,” select a name for the new feature list and click “Add.” The next screen will have a long list of features that you may disable by removing the check from the box next to the name of the feature.